I adore the River Island victoriana tops, I have a black one from River Island I bought last year..See photo below and I am going to buy the cream one above it looks great on, I tried it on in store the other day..
River Island bags (the gucci 'homage' bag above is great) and swimwear are fab, definitely worth a look. I love the swimsuit above, it has a designer-esque look and the back of it is gorgeous - it looks like a bikini from behind. Think I may 'need' the pom pom gloves too, they are so cute and perfect for now. 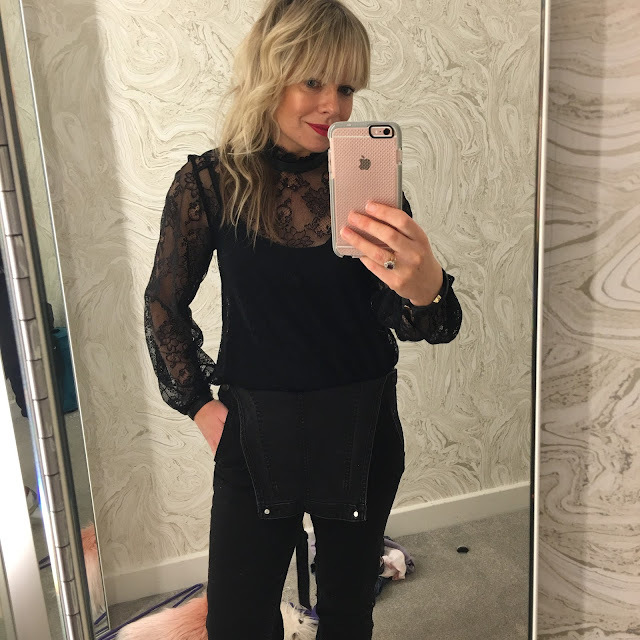 River Island also have some great denim pieces, I always find the fit and stretch good, the dungarees are such an easy item to wear and the jeans above are ideal for the Spring, a great colour and cool, frayed hem..perfect. Also if you fancy letting an expert do the hard work for you and are planning a trip to Oxford Street, arrange a complimentary appointment at the River Island style Studios (the River Island nearest Marble Arch) They have a great, really lovely stylist team there who will help you find a look that is very you! **This is not a sponsored post..I am a bit of a fan of RI at the mo and will be using the 25% offer! !